I had plans to cook more this weekend, but I didn't. I had plans to prepare a blog post, but I didn't. I had plans to do all of my laundry, but I didn't. I meant to fit in an extra workout, and I meant to get ahead on work. After a 13 hour day yesterday, I came home, thought of all of these things, and found myself exhausted, stressed, and frustrated with my self. When will I fit everything in? My typical response would be to make a plan, wake up early, and work towards getting everything done. Have to meet my expectations, right? Not necessarily. I woke up and realized that that's not what I need right now. How about I focus on the positive? My strengths, my intentions, my heart. Instead, I need to practice being kinder to myself. Being gentler with myself. I'm going to spend my extra time this morning on me. On efforts to cultivate my capacity for kindness. I will focus my loving-kindness meditation on myself, rather than others. 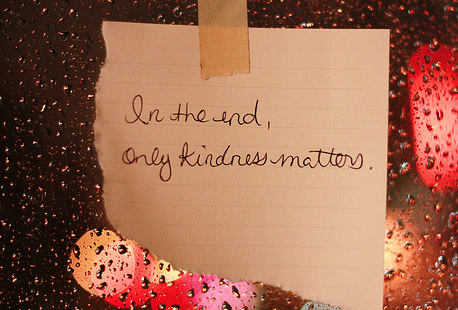 Because really, being kind to yourself and being kind to others should be one and the same. Don't choose one or the other. To learn more about loving-kindness meditation, or metta, google is your friend. There are lots of resources out there; even free audio files to lead the meditation for you. 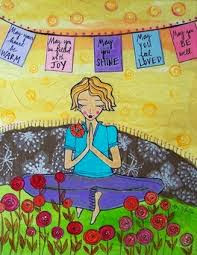 I recommend starting with you, then practicing loving-kindness towards others. Oh man do I need this. I was a major stress case yesterday and took it out on the man friend. It was clear to both of us what I was doing so I stopped myself but today I am focused on being kinder to myself and to others. Rome wasn't built in a day! I love this! I need to hear this message of being kinder to myself. I get very caught up in the judging myself for things I don't do. Thanks for posting this! love and so agree - I've been doing the same. 2014 is the year I *start* loving myself more - less self-criticism and more self-love... the kinder you are to your self, the happier you are and the better able you are to participate in the awesomeness that is life!